Change is certainly happening as we implement Guided Inquiry and Visible thinking in our school. As thinking – ideas and questions – become the focus pedagogy also changes. Place and communication can become very important. 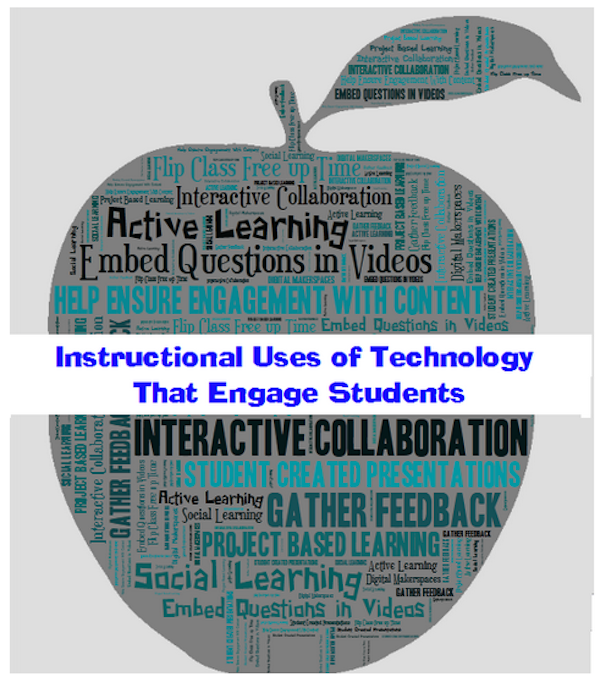 Kelly Walsh shares ’10 highly engaging uses of technology in the classroom, along with dozens of tools and resources for implementation’ in 10 of the Most Engaging Uses of Instructional Technology (with Dozens of Resources and Tools). This is a great place to explore for new ideas as the new school year begins. 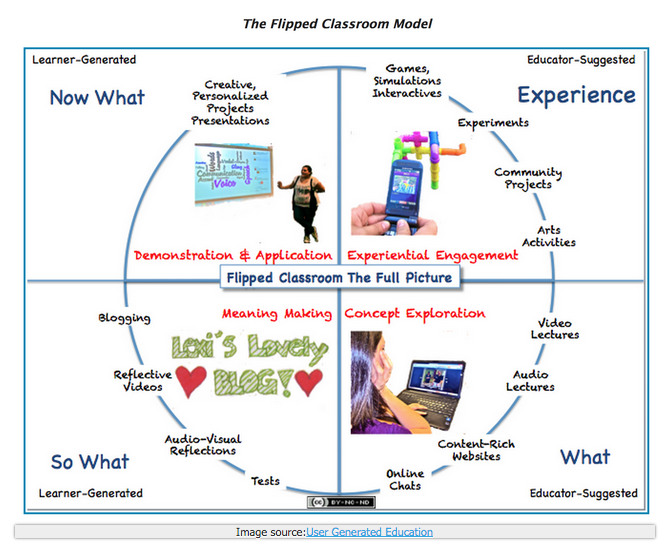 Educational Technology and Mobile Learning have posted a graphic and two videos to explain what in entailed in ‘flipping’ your classroom. It is one of the best explanations I have seen. As personal technology use expands in our school with the implementation of BYOD, Flipped Classroom is now a possibility. Champlain Valley Union High School have sent this infographic via their Twitter feed. 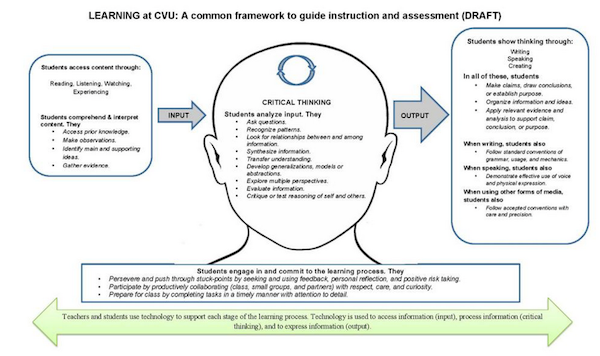 It visually illustrates the important role of Critical Thinking in learning. So many different learning frameworks and discussions are taking place but the more I look at them and compare them the more I realise just how encompassing the Guided Inquiry Design Process is – as it embeds all elements found in the others. During Guided Inquiry students discover ‘content’ according to their interest in a topic area then go on to analyse and finally to share and evaluate their learning. This infographic illustrates this process very well. In the Guided Inquiry Design Process, assessment occurs throughout the whole process – Assessment ‘for’ learning,’in learning’ and ‘of learning’. Students share in Inquiry circles at various stages and all learning is transparent and shared. The support of the teacher and teacher librarian make it a truly collaborative experience. The Learning Myth: Why I’ll Never Tell My Son He’s Smart by Salman Kahn from the Kahn Academy looks at ways to ‘grow our intelligence’. With such easy access to resources and activities the potential is there to grow our ‘mindset’. 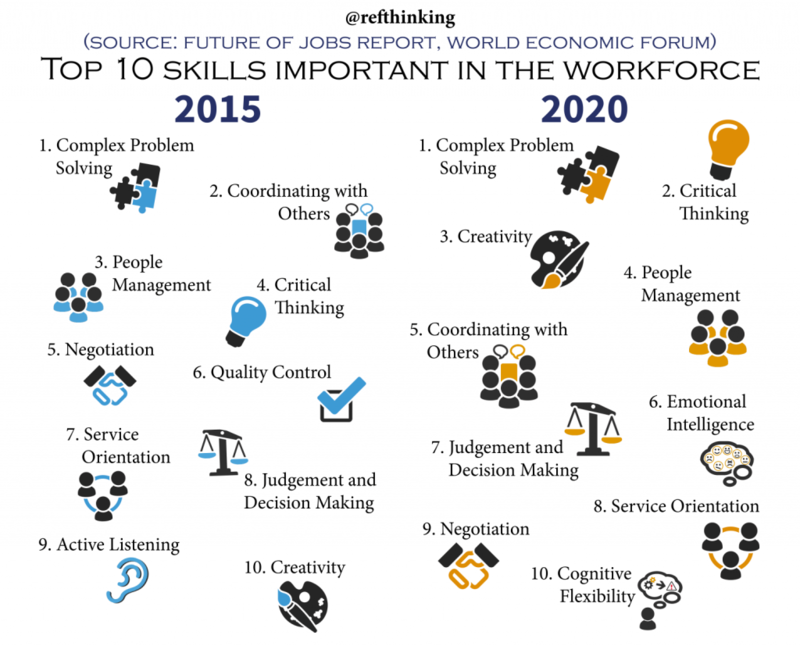 The MindShift post by Christina Farr No Courses, No Classrooms, No Grades — Just Learning, describes how some students in the USA are taking time out of school to enrol in project-based learning that pairs them with real projects of problems that need solving. 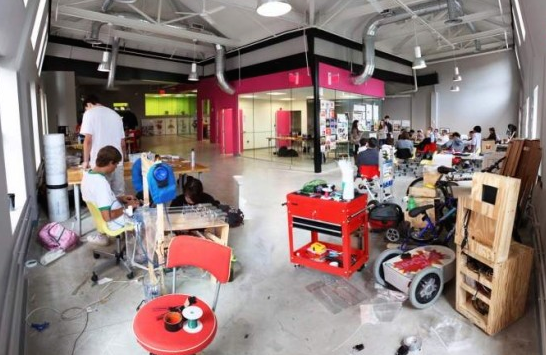 “NuVu is a full-time magnet innovation center for middle and high school students. NuVu’s pedagogy is based on the architectural Studio model and geared around multi-disciplinary, collaborative projects. We basically teach students how to navigate the messiness of the creative process, from inception to completion. No Courses: Instead, we have studios. Around 12 kids work closely with their 2 coaches on solving big (and small) open-ended problems. No Subjects: Instead, everything is fused together. Students find themselves moving between a studio that requires them to design a telepresence robot to another that requires them to re-imagine Boston with a cable car system. No Classrooms: Instead, we have an open space that changes all the time to adapt to the needs of every studio. No One-Hour Schedule: Instead, students spend two weeks from 9-3 solving one problem. On a smaller scale – many schools are now making pedagogical changes to using Guided Inquiry or Project Based Learning where students select a learning topic that is of relevance to them and where they can develop creative new solutions to issues and problems. 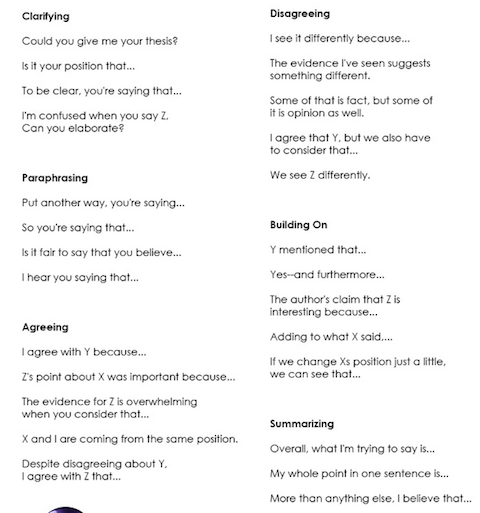 This post from Teachthought offers 26 sentence starters to lift the level of discussion in the classroom. During meaningful conversations, students are forced to be accountable for their positions, to listen, to analyze opposing perspectives, and to adapt their thinking on the fly. I particularly like the summarising starters as I think often we fail to draw learning to conclusions and to evaluate findings. Our Year 10 students will be incorporating this theory into their Guided Inquiry unit of work this term. It will assist them to construct a deep question for their research, analyse their findings and create solutions to selected issues. Bloom’s taxonomy can also be used by teachers as a tool for differentiation and assessment. 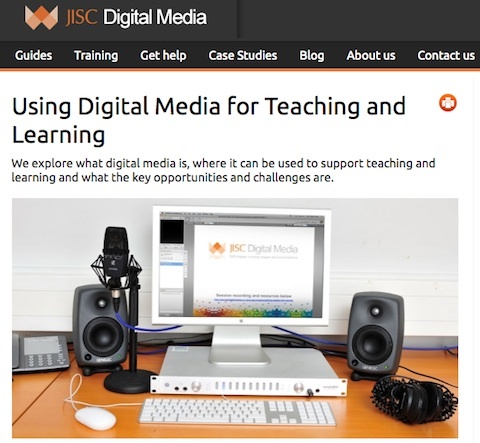 There is so much to think about and to learn about digital media on the JISC site linked below – and all in one place! encourages consideration of context, learners’ roles, content, learning outcomes, activity, feedback and re-usability – focusing on what the learner does with an artefact rather than giving priority to its subject or discipline content. Eight core learning designs and six core learning spaces are described and then digital media to assist in transforming learning is placed into the equation. As Australia looks at implementing a new national Curriculum, courses are being developed and programs rewritten it would be a great time for a rethink of how Digital Media can play an important role in encouraging the learner to use their ‘product’. 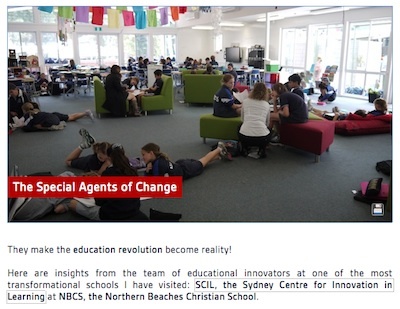 Northern Beaches Christian school is leading the way in changing the model of education. Common learning spaces and student selected activities support curricular work. Videos of the Principal’s vision, students at work and teacher’s perspectives can be seen in this link from the playDUcation blog. 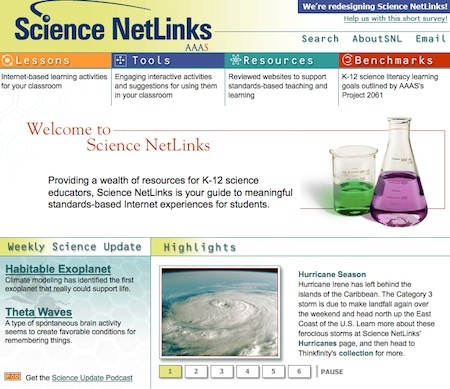 Make learning fun – search for a science related topic area and complete the related online activities! 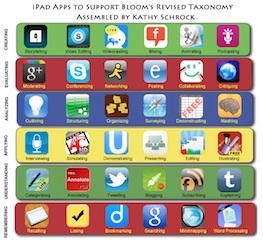 Kathy Schrock’s Blookin’ iPad has a wonderful chart organising iPad Apps according to their use within Bloom’s Taxonomy . She would like more people to fill in the Google Survey if they have found other useful Apps. Having looked for some time for a simple ‘mindmapping’ tool, I was excited to trial the one suggested here and then upgraded for $2.99 for added features.